Most people don’t ponder much about light. We flick switches and twiddle knobs and only think about the power of light when there is a power-cut and we have to dig out the candles. A new contemporary art show at Longwood Gardens, Pennsylvania, showcases the work of Bruce Munro, a man who spends his life thinking deeply about light and the effects it has on its environment and its viewers. Bruce Munro is an English artist who has been working with light for three decades and is gaining an international reputation for his large-scale installations. He has exhibited at the Victoria & Albert Museum in London, as well as the Guggenheim in New York. 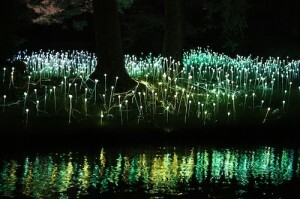 Utilising boggling amounts of materials – one piece entitled Forest Walk uses 86.9 miles of fibre optic cable – Munro has transformed areas of the Longwood gardens into outdoor art galleries that come alive at night. Together these works are a huge undertaking and the scale of the site-specific, low-voltage works is breath-taking. Waterlilies in bloom for example is created from 68,000 recycled CDs whilst Water Towers includes 17,388 1-litre drinks bottles. Munro’s work uses everyday items such as bottles and CDs to try to recapture those moments in life when we lose ourselves. He has commented that permanent sculpture can have a tomb-stone quality, a criticism that cannot be made of his environmentally astute installations that change their appearance from day to night and over time. Surrounded by the natural environment the pieces change as the grasses around grow and retake their place among the installations. Munro’s interventions become harder to see during the day and the contrast with their appearance at night increases dramatically. 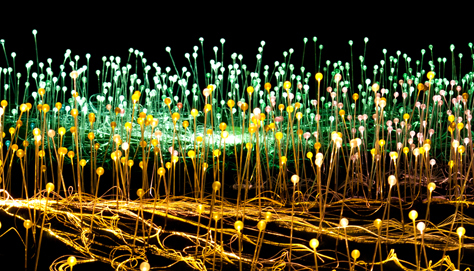 One of Munro’s star exhibits is the Field of Light, inspired by a visit he made to Ayres Rock in Australia. He comments that ‘Deserts are infertile, barren places, until it rains and then they bloom like a veritable Eden.’ He wanted to create a work that ‘like the dormant seed in a dry desert, would quietly wait until darkness falls and then…bloom with gentle rhythms of light.’ The idea lingered in his sketchbook until he was able to finance the installation. Created from 7000 glass spheres on stems and 38 miles of optic fibre a huge expanse of light greets the viewer from the far side of a small lake, reflecting in the water and slowly changing colour as though ripening. The artist is playing digital farmer, creating an electronic crop that reminds just how much is involved in the simple things we take for granted. Munro draws attention to the fact that the workings of our digital age are as seemingly mysterious as the flowering of a plant. Visually the piece shimmers, the reflection in the lake adding another ethereal layer. With light deliberately leaking from the fibre optic cables there is a real sense of confusion – you know you are seeing something man-made, yet it feels as though you have snuck into the farm where they grow color. And it’s harvest time. 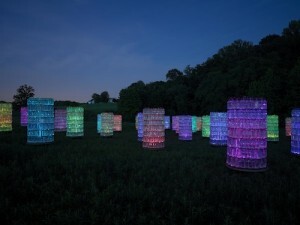 Water towers is a piece that combines sixty-nine towers – each composed of 216 full litre bottles – with lights and sound. It was inspired by the novel Gifts of Unknown Things by Lyall Watson, in which a young girl possesses the magical gift of seeing sounds in colour. Munro’s homage is a colourful, watery, musical maze which seems to dance as the lights change to the music. He has combined the voice music of Orlando Gough so that each tower solos a different human song that merges with the others in a touching lament. Having reached this far around the exhibition it was now dark. My handwriting needs a practised eye to interpret at the best of times. Even with a Mont Blanc and pristine papyrus it’s always a bit What does that say? So when written at night it becomes more than a little unintelligible. Did I really write – Wallet, elections, 8 Toms? How is that relevant to a light installation? The next line appears to say Intrinsically a baddie at work in a beautiful muse. Maybe I suddenly took up surrealist poetry. Luckily there was more work inside the four acre conservatory. Here Munro has hung large versions of his signature snowball chandeliers which glow in a slowly changing kaleidoscope of colors. Hung from the ceiling and hovering over the plants the glass balls contain wisps of fibre optic that light up like twirls of electric knitting. As well as 5500 different types of plants the conservatory also houses Munro’s Light Shower that descends from the heights over the flooded fern floor. More than 1600 drops of light twinkle and flicker, reflecting in the water and creating an exotic rainfall that sparkles without soaking and becomes more intense as the evening becomes night. There are several other large-scale outdoor light installations for the visitor to discover and the historic music room is also host to an indoor exhibition of smaller pieces that capture Munro’s fascination with light as a means of communication. Longwood is one of the world’s great horticultural gardens, covering over 1000 acres and any artwork displayed has to be sensitive to the natural surroundings and existing landscape. Munro has made sure that his works are environmentally sustainable. All materials will be recycled or reused in future installations, and each work requires only a very low power supply. Longwood has a 1.5MW solar field and on a sunny day produces enough energy to run several of the installations many times over. In order for visitors to fully appreciate Munro’s works the Longwood gardens are staying open into the evening for the first time. This gives a great opportunity to experience the changing atmosphere as the darkness settles over the plants and the lightworks become the focus of the Gardens. Longwood Gardens is located on US Route 1, about 3 miles northeast of Kennett Square, Pennsylvannia.